Have you ever been confused by the names we have for the color of our skin? Simone is looking for a better color to identify herself with. She asks everyone she knows what color she is. The answers she gets don’t help at all. 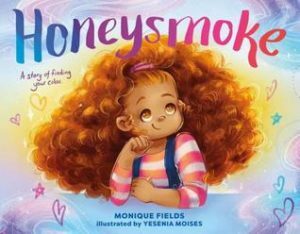 She finally finds some guidance to help her find her color: honeysmoke. And if feels just right. This is a beautifully illustrated concept that can help all of us to see the differences we have as ways to connect. Loved it!